The WB2HOL Tape Measure Beam is one of the standards for transmitter hunting. The beam as provided in the kit is good for 2M but it has also been successfully scaled for use on other frequencies including 121.5 MHz (used for ELTs.) A complete kit is also available that includes the tape measure beam with an assembled and tested offset attenuator and enclosure. A choke balun consisting of 6 - 8 turns of coax around the beam will help reduce the pattern skew significantly. It is not shown on the plans for the WB2HOL Tape Measure Beam, but should still be added to the antenna. Note: If your radio has an SMA connector, a BNC to SMA adapter will be required (not included.) We have seen a couple of problems with bad BNC to SMA adapters (center pin not making contact) so double check that if you need to buy one. 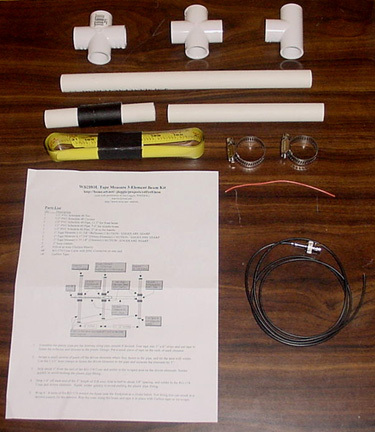 Construction plans for making the Tape Measure Beam antenna are available on the WB2HOL web site. The kits are $21.00 each plus $8.00 for shipping. To order, payment can be made by check, money order, or PayPal (my email address is my PayPal ID.) Please email me first to confirm what kits you are purchasing. My callbook address (KE6HTS) is good and my email address is: . Note: This kit is provided with permission from Joe Leggio, WB2HOL.